Hong Kong/New Delhi: India may launch an anti-dumping probe into imports of Chinese solar products within a month, China’s commerce ministry said, but a top Indian renewable energy official denied on Tuesday that any such plan was in the works. If New Delhi investigates allegations of unfair Chinese trade in the solar energy sector, it could be yet another challenge for China’s solar companies, weeks after the United States decided to probe sales of their solar panels. But state-run Indian Renewable Energy Development Agency denied there was any such plan to lodge an investigation against Chinese solar imports. “China is getting unduly worried about this as it is a massive manufacturing centre which feels it may not be able to participate in the Indian market," said Debashish Majumdar, chairman and managing director of Indian Renewable Energy Development Agency. “Our rules are not China-specific. If they want a piece of the action in India, they can come here and set up manufacturing units. There is no move afoot to start anti-dumping proceedings against China." The India Commerce Ministry wasn’t immediately available for comment. India’s solar programme, which envisages the production of 20 gigawatts by 2022, aimed to boost the local solar industry and benefit local suppliers such as Indosolar Ltd, Moser Baer India Ltd and Tata BP Solar India Ltd. But the programme also has attracted business from Chinese suppliers Suntech Power Holdings and Trina Solar Ltd , whose solar cells and panels could now be competing with locally made equipment. 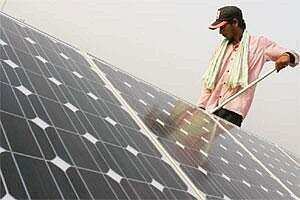 India’s solar programme stipulates that solar cells will have to be sourced from within the country after 2013. Until then solar power firms in India are free to import cells. Chinese industry officials say any investigation is unlikely to have a significant impact on Chinese solar manufacturers, estimating the size of trade in solar products between the two countries at up to $400 million yearly. “China and India’s solar product trade is very small, about $300 to $400 million yearly, and won’t have a big impact on Chinese manufacturers," said Sun Guangbin, head of the solar energy & PV product branch of the China Chamber of Commerce for Import and Export of Machinery and Electronic Products. “India could just be following the US anti-dumping action," he said. Tang Xiaodong, an analyst at Shanghai-based research firm CEBM, said India’s imports of solar equipment might continue given the country’s limited manufacturing capability. “India’s manufacturing capability is relatively low, but in the long term the market size can grow bigger," Tang said. “India requires foreign companies to set up manufacturing plants in India. This might be one of the ways they’re doing to protect the domestic solar industry and local jobs." Earlier this month, the US International Trade Commission approved an investigation into whether the Chinese government provides illegal subsidies for its solar energy sector and whether Chinese companies are selling solar cells and panels in the United States at unfairly low prices.